Hot this week: Museum theft organized crime mass conviction. Heck yeah! Against the movement of archaeologically excavated, publically held artefacts onto the private art market. “Inside the quiet world of deaccessioning”. The looted piece was bought in Belgium. Swiss art collector Jean Claude Gandur bought the piece, discovered it was stolen, and returned it. The trial of Ahmad al-Faqi al-Mahdi and heritage destruction as a human rights issue. The two pieces had ‘a security chip’ but it is unclear what that means. The postcard sized painting was being sent to an exhibition. The stolen pieces were found tossed in a stream. One was arrested. Colonial money was returned from Argentina. The documents were stolen from the Russian State Historical Archive, the Russian State Archive of Literature and Art and the Russian State Military Archive. An exhibition of artwork that explores the lost pieces from this heist. The two congress people express concern about the slow pace of art repatriations. The painter said UPS systematically stole art from packages and sold them. A month after the native artworks were stolen police were able to recover them. Charges have not yet be filed against the individuals they were seized from. They have paid $5m on the $37m, but no more. Apparently Christie’s and Mugrabi have reached a settlement over the Basquiat. In 1951 a collector consigned the artworks on long term loan to a museum in Linz. The family asked for them back in 2006 but the museum couldn’t produce them. Most of the pieces sold by Ante Topic Mimara to the Yugoslav state were fakes. The piece was commissioned from C215 but no one told the anti-graffiti squad. How very strange. The Prince, who isn’t selling the piece, thinks it is real. He had just loaned it to an exhibition in France. This one is sure to scare folks. More money for the Gurlitt collection research. The new “The Institute for Artists’ Estates”. The sales at Tefaf in Maastricht are scheduled for March 11–20. They were taken in the chaos following the fall of the Soviet Union. Very little information has been provided here so we should not rush to any conclusions. Photos of objects needed. A deep time look at church theft past. They noted that in the 19th century, church thefts usually took place at night and in winter. The unique first century hydraulic work had been damaged by block looters. Lauder believes that art sold to fund escape should be treated like looted art or forced sale. It was stolen then found more than a year ago. Now the piece by John Sutton is back. Twenty-nine crimes have took place at churches in Powyes last year including sacred art and bible theft. The piece was taken 2.5 years ago and it appears to have been returned out of remorse. The piece was crafted in 1725, stolen in 1986, bought by a collector in 2015 who did his own provenance research on it. When he discovered it was stolen, he returned it to the Hull Museums! Finally, a major organized crime conviction for an antiquities theft group. A longer piece on this major conviction. Several market experts speculate that if the items have been taken to China, they are not recoverable. Listen to me talk about the case on PRI’s The World. And yours truly is that expert! Various experts commend the police effort that went into this major conviction. 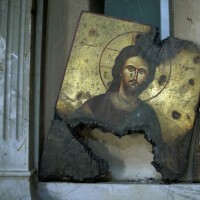 About 50 icons were taken and found in the home of a local church attendant. The director of the national museum said “we still have to work to find the others”. “It’s not acceptable to see many lost national treasures of China scattered overseas”. A lingam was taken from this temple. The high court has ordered stringent action in temple theft cases. A watchman and five accomplices are suspected in this theft of a gold crown, three silver crowns, and various other temple ornaments. The five accused were employed by the temple. Treasure hunting teams with metal detectors are destroying ancient monuments. Ornaments, gold eyes, tilak of lord Hanuman were taken from a temple in Girisola village of Ganjam district. “A panchaloha idol and some other valuables from the Asha Pooraha Ganapathy shrine at Ganapathy Nagar”. The returned Goddess Umaparameswari Amman made an appearance at the Kapoor trial. Some question about some of the facts in this piece. All the gold and silver ornaments of the goddess were taken. A security guard was involved in the theft of a crown, some ornaments, and cash. Ten treasure hunters were arrested while digging a 50-foot hole inside a Spanish colonial cemetery. A parish priest had allowed the dig. The first in a series that looks at the history of individual antiquities that have been destroyed recently. Very little, says top experts. Most of what is out there is rumour, speculation, and even lies. The gang committed dry runs of the library heist. Manuscripts haven’t been recovered. Reporter James Harkin discusses his time on the ground in Syria. The story of Palmyra’s demolished temple. Loss from this site with quotes from Jesse Casana. The loss of the minaret of Aleppo’s Great Mosque. The lion, another object gone from Palmyra. Have researchers at QMU revealed Banksy’s identity via geographic profiling. The crate the pot was in was labelled “art”. Sly. On regret of theft and return. Thank goodness, this 6 foot fibre glass bow-tie has been recovered! Corruption and fraud in the most cherished of institutions…crosswords. Yes, this is the fellow who brought us George W. Bush’s bathtub self portrait.